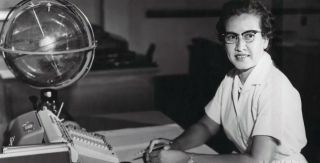 Katherine Johnson, pictured here at NASA's Langley Research Center, where she worked as a "computer" and mathematician from 1953 to 1986. Langley dedicated a computing facility to Johnson in a ceremony today (May 5). NASA honored 97-year-old mathematician Katherine Johnson today (May 5) by dedicating a building in her name at the space agency's Langley Research Center in Hampton, Virginia. Speakers at today's ceremony included Virginia congressmen and the mayor of Hampton, as well as former astronaut Leland Melvin, who offered Johnson a Space Flight Awareness Silver Snoopy Award that had been flown on the space shuttle Atlantis. "Millions of people around the world watched Shepard's flight, but what they didn't know at the time was that the calculations that got him into space and safely home were done by today's guest of honor, Katherine Johnson," Clayton Turner, Langley's deputy director, said at the dedication. At Langley, Johnson performed calculations for airplane safety and rocket-launch experiments, starting in 1953 as part of a pool of female "computers" and continuing until 1986. She worked by hand, and then with mechanical calculators — starting at the African-American-only West Area Computers but moving after two weeks to Langley's flight research division. Eventually, Johnson worked with electronic computers, whose work she checked before the calculations were used in John Glenn's groundbreaking orbit around the Earth in February 1962. Last year, President Barack Obama awarded Johnson the Presidential Medal of Freedom — the nation's highest civilian honor — for her outstanding technical contributions to spaceflight. The Katherine G. Johnson Computational Research Facility at NASA's Langley Research Center, dedicated today (May 5), commemorates Katherine Johnson's exceptional work calculating trajectories and orbits as a NASA mathematician. The building named in her honor, the Katherine G. Johnson Computational Research Facility, is the fifth to be named after a former Langley employee. "The Computational Research Facility will be a 40,000-square-foot (3,700 square meters) consolidated data center that will allow our engineers and scientists to perform advanced computational research and development, crunching data and numbers that will one day help NASA land humans on Mars; design quieter, faster and more efficient future aircraft; and help us better understand our changing climate," Turner said. "It's not unlike the work that Katherine did in her tenure at Langley, helping NASA send the first Americans into space, into orbit around Earth, and to the moon and back — except she didn't have a 40,000-square-foot building full of cutting-edge technology." Johnson is the subject of an upcoming book, "Hidden Figures," which describes her achievements and those of other female, African-American mathematicians at NASA. A movie version of "Hidden Figures," starring Taraji P. Henson as Johnson, is currently in production by 20th Century Fox. The book's author, Margot Shetterly, shared thoughts about Johnson and t women of NASA whom she admired, and the cast of the upcoming movie congratulated Johnson in a new video. Afterward, Johnson received the Silver Snoopy Award to commemorate her key role in putting people in space — its presenter, retired astronaut Melvin, worked with her at Langley before flying two missions on Atlantis. Both Shetterly and NASA Administrator Charles Bolden noted one of Johnson's favorite sayings: "You are no better than anyone else, and no one is better than you." "I think that the real subtlety — and the meat, the power of this statement — is the part that says, 'You are no better than anyone else,' and really, this is one of the reasons that Ms. Johnson's story has captivated us," Shetterly said. "She has such a towering talent, but she has gone out of her way to recognize talent in other people, regardless of their gender, of their race, of their background. If you're a smart person, then she wants to have a conversation with you." In fact, Shetterly said, part of the reason Johnson's story wasn't well known until recently was that she is so modest and insists on talking about others' achievements rather than her own. "Thank you so much for your attention, your kindness — and so happy to see them giving more recognition to women for the work they have done," Johnson said after the presentations ended. "At the time, it was just another day's work." "And you can just look at me and say that 'she did her share,'" she added.